ATLANTA, Georgia (CNN) -- During six years as inspector general of the Transportation Department, Mary Schiavo earned a reputation for blunt, unfiltered criticism of the Federal Aviation Administration, the agency charged with assuring the nation's air travel safety. The former assistant U.S. attorney earned the nickname "Scary Mary" for repeated warnings about flight safety. Schiavo resigned in 1996 after the FAA moved toward classifying a report she issued taking the agency to task for lax security. A professor of aviation at Ohio State University, Schiavo remains appalled by airport security in the wake of the September 11 hijackings. CNN.com's Mike Fish recently spoke with Schiavo. The FAA declined to comment on Schiavo's remarks. CNN.COM: You have referred to the Federal Aviation Administration as an agency that is "dead on arrival." What do you mean? MARY SCHIAVO: Part of that was a Freudian slip, because frankly, they don't act until people are dead. They don't even begin to address the problem until we're dealing with a body count. ... They are dysfunctional. They cannot deliver the security. They had more public relations persons than security personnel. They simply don't like being the cop. One of the best ways you can show that is through their enforcement record. Even when they do have to enforce -- and we did a study on that when I was inspector general -- if you look at the fines they announce they have levied, they collect about 10 percent. So they make these big public pronouncements and then they negotiate them. CNN: What emotions do you experience now having witnessed the tragic events of September 11? MS: It is so unnecessary and so sad. On this one, everybody gets smarter, but the airlines and FAA get smarter, too. What upset me the most was that the second half of the airline stabilization bill, which passed [the week after the September 11 attacks] before anybody knew what hit them, really does strip the victims of a tremendous number of rights. There is no discovery. Their own personal insurance goes to obviate the airline liability, which is absolutely unconstitutional and will be challenged. CNN: How do you explain the Washington politicians going along with it? MS: The emotion of the moment and well-placed contributions. You also have the fact that the airlines have admitted now that as soon as this happened, they took to trolling the halls of Congress to get through their protective packages and obviously there was nobody up there to speak for the dead. Years down the pike, this will be a shameful couple weeks in American legal history. CNN: As plans are debated over how to beef up airline safety, should the FAA play a role? MS: My answer is no. I just pulled up on the (World Wide) Web the supposedly new and improved FAA sure-fire plan for security. Well, it is the same thing. I don't know how many tragedies and disasters we've witnessed; this is not the first. The FAA was one of the causal factors cited as causing Pan Am 103. Now clearly, the agency is a causal factor here, no matter how you look at it. Either it is everything from bad screening to a bad policy to a ridiculous system, where we have a thousand different security plans in place. But the FAA should absolutely not have a role [in improved security]. We have a brand new office of homeland security. This is a law enforcement function. It was clear from being in the government that the FAA can't do it and doesn't want to do it. We chase murderers with police. We don't chase them with FAA and low-bid contract employees. CNN: How deep a factor is the influence the airlines hold over the FAA? MS: This is an age-old problem. The FAA was formed with a conflicting mission. Granted, they'll say in 1996 they changed their mission so as not to be so in deference to the airlines, but they changed promoting aviation to encouraging aviation. It is still there. CNN: Where do you see it? MS: All you have to look at are the two commissions the president appointed [following the September 11 hijackings] in the wake of the worst aviation tragedy in history. It is industry people. No one spoke for the dead on those committees. And it is really clear, the day after the tragedy (the airlines) were trolling the halls of Congress to get their airline stabilization bill, which basically gives them a pass on liability. Time and time again, when I was working on ... cases, the FAA administrator at the time wanted it stopped because it cost the airlines too much money. On ... security, now the airlines are saying we didn't have anything to do with security decisions. Well, they did. On the background checks, we debated whether employees needed background checks and the airlines objected because it cost between $1,800 and $3,000 per employee to do a full background check. They said, "No, it'll cost too much money. Americans would never pay for it." CNN: What is the time reference? 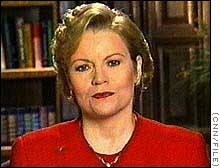 MS: The mid-1990s, while I was still inspector general. Believe me, the influence is pervasive. All you have to do is pick up the Center for Public Integrity's list of contributions to senators and members of Congress. CNN: You resigned in 1996 after the FAA began the process of trying to get a critical report classified. [The report detailed lax security at the nation's major airports, revealing how agents were able to sneak fake bombs, hand grenades, guns and knives through metal detectors.] What happened there? MS: The FAA was insistent the report would be classified. They sent it to the classifiers and the classifiers -- it was the State Department - said, "No, if it is embarrassing, that is unfortunate for you, but that doesn't make it national security." The [FAA] appealed and eventually, after I was gone, managed to get most of it withheld. But it was such an incredible resistance for the public outcry. Not one thing the FAA said was so much concern about the security. They just didn't want the public to know. CNN: Rather than a complete takeover of airport checkpoint screeners, it's been proposed that the government set standards for entry qualification, training, and salary -- but then contract with private security firms. Is this the best solution? MS: No, they should be government employees. If they are government employees, they are citizens. They have to be by law. They have to have had a background check. You may not like government employees, but one thing about them is you have a low turnover rate. Government trains its employees. And they would have a job progression. I don't know why this is such a special case, stirring all the talk about government bureaucracy. Well frankly, why in the world not? When somebody tries to kill me in my home and I call 911, I expect a real cop to come and I pay for it. When someone tries to kill me on an airplane, I don't get real law enforcement. This is nuts. CNN: Finally, where do you point the finger for the events of September 11? MS: I take it out on the government. In the end, the airlines do what they are supposed to. Because they are private business, they are supposed to try and get away with everything they can to save the bottom line, to make their investors on Wall Street happy. That is how this game works. The flip side is we expect our aviation cops, the FAA, to keep us safe. That is the weak link. That is the one thing you can't get around no matter how you do the scenario. The people, who by law are supposed to protect us, didn't.